MAX'S BIRDING DIARY: SAND MARTIN FEST AT MARSH LANE. 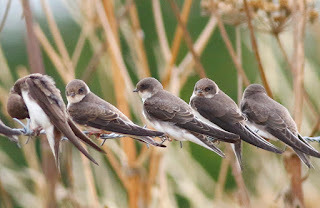 SAND MARTIN FEST AT MARSH LANE. Went to the local patch again this morning getting there at 8.00 AM. It was gloomy and much cooler than of late .There was no one else there.The signs were not good for a good visit and then to make matters worse the CP hide was closed the floor had been painted. Was cheered up a bit when my young friend the Cetti's Warbler showed in the reeds from the causeway hide. There was a flock of a dozen House Martins along the streamline trees but it was too gloomy to get any shots.Things looked very quiet from the Oak hide (Did have a KF flypast though) but just as I was about to move on a bird dropped in on the reeds to the front right of the hide.It was a Whinchat. Wow ! ! I grabbed the camera just as it dropped down into the undergrowth.Never saw it again despite searching everywhere so no shots.I was not a happy bunny. Back in the car park I was amazed too see how many Sand Martins were zooming around the path to the CP hide.They perched on the fence wires several times and I managed a few shots.I counted 75 on the fence and with others flying around I reckon the were well over a 100 there on this CP pool area alone. I found it hard to get many of them in focus at the same time when they were perched but I hope these shots give an idea of the numbers. Took a few single bird shots.Cracking birds.